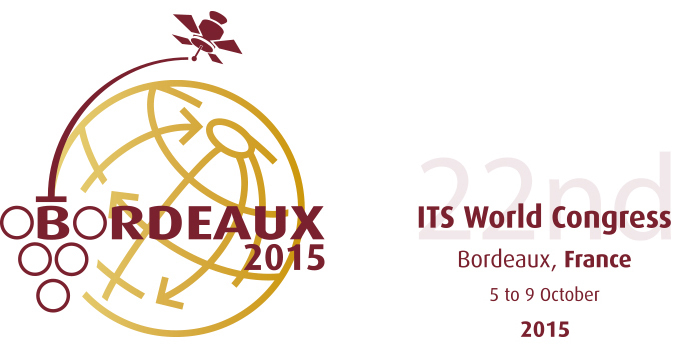 The ITS Congress and Exhibition is the world’s largest event in intelligent transport systems and services. From 5 to 9 October 2015, global transport leaders and policymakers will gather in Bordeaux (France) to discuss the latest solutions for safety, reliability, sustainability and connectivity of transport systems worldwide. Through the main theme “Towards Intelligent Mobility – Better Use of Space”, the Bordeaux Congress will focus not only on how achieving intelligent mobility will change our lives but also on the benefits space can bring to ITS applications. The new satellite constellations for geo-localisation, earth observation and communication will bring new opportunities to the ITS world. In addition to the 300+ sessions, the 22nd ITS World Congress will present ITS and transport latest products and services from over 100 leading companies worldwide in a large and unique exhibition of 25,000sqm. The social programme is more exciting than ever with dozens of networking events and an unforgettable gala night in one of the stunning Bordeaux chateaux. ERTICO – ITS Europe is proud to organise the ITS World Congress 2015 (5–9 October 2015) in partnership with the European Commission, ITS America and ITS Asia-Pacific. The Congress is hosted by TOPOS Aquitaine on behalf of the City of Bordeaux, Bordeaux Metropolis, the Departmental Council of the Gironde and the Aquitaine Region and with the strong support of the French Ministry of Transport, ITS France, CEREMA and IFSTTAR. By the end of May, the European Union Research Project “Intelligent Cargo in Efficient and Sustainable Global Logistics Operations“ (iCargo) comes to its end. At this date, the iCargo consortium had 43 months of intensive research, testing, and prototyping in the field of transport logistics and supply chain management in conjunction with emerging Information- and Communication Technologies (ICT). With this mail, we would like inviting you to the iCargo’s Final Event Session. This session will be organized during the Transport Logistics Trade Fair 2015 in Munich (Germany) and aims presenting the achieved research outcomes including business, technical and pilot demonstration. We are delighted welcoming presenters from world’s leading organizations as DHL, Unilever, ATOS, CGI, etc. Save the date of the next ALICE CONFERENCE 11th February 2015 at Schiphol Airport, Amsterdam. Additional information can be found here. The agenda is available here and the registration form is also available here. Enhancing transport logistics cooperation through Intelligent Cargo (iCargo). Agenda available here.